Success is often achieved through (or despite) a blend of external and internal influences in our life. 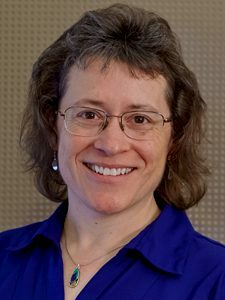 Our speaker, Heidi Yantz, will explore influences that can affect the path women take in STEM, drawing from the experiences of friends, coworkers, and herself, as well as a few prominent women scientists. Heidi is a 1983 PT High School graduate and received a 1984 scholarship from us! She received a BA in business from the University of Washington and earned a Masters in geosciences from UW-Milwaukee. She is a licensed hydrogeologist and a principal at a Portland-based engineering firm. Click here for YouTube video of our first 60 years! Read and see more about our long-time members…. 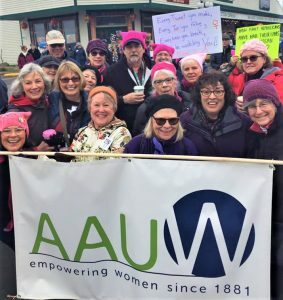 AAUW Port Townsend is the largest AAUW branch in the state of Washington. The branch includes nearly 200 active and involved members living in and around the historic seaport town of Port Townsend, Washington. We have been active advocates for women and education since the branch was founded in 1948. Read more detailed news about us…. The Port Townsend Branch of AAUW is committed to advance gender equity for women and girls through research, education, and advocacy. We will remove barriers and develop opportunities for all women and girls in East Jefferson County to reach their full potential. Our vision is equity for all. to honor women who demonstrate leadership and commitment. In principle and in practice, AAUW values and seeks a diverse membership. There shall be no barriers to full participation in this organization on the basis of gender, race, creed, age, sexual orientation, national origin or disability. Interested in joining us or donating? See information on Membership Join Us page. Contact us anytime to chat about our activities and organization: membership@aauwpt.org. Read more about UWF and donations.